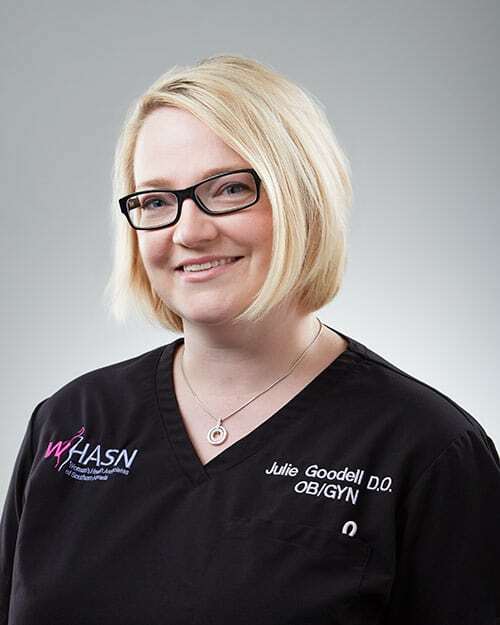 Dr. Julie Goodell is a native of the Pacific Northwest where she received her Bachelor of Arts in voice performance and a Bachelor of Science in psychology at the University of Washington. She attended medical school at the Kirksville College of Osteopathic Medicine in Kirksville, MO and completed her residency in Obstetrics and Gynecology at St. John’s Episcopal Hospital in Far Rockaway, NY. She has had the opportunity to live all over the United States and is very happy to be close to her family in Las Vegas. Dr. Goodell has a great love of working with and helping people, and feels blessed to have the opportunity to help people in such a meaningful way. She is a fellow of the American College of Osteopathic Obstetrics and Gynecology, a member of the American College of Obstetrics and Gynecology as well as the American Osteopathic Association. When not spending time with her beautiful daughters and husband, she can be found reading a good book or taking a cooking class.